Unless you’ve been living under a rock (one not shared by a Paleo cave dweller) you have probably heard about Dave Asprey, The Bulletproof Executive, and his magic coffee. Dave is the computer genius and entrepreneur who hacked his own biology, upgraded his brain by more than 20 IQ points, lowered his biological age, and lost 100 pounds without exercise while eating over 4,000 calories a day. Some coffee shops around the country are starting to serve Bulletproof coffee. I hope it will eventually be available here in Seattle, the coffee capital of the world, where the locals mainline their caffeine to get up and running in the dark on winter mornings. If so, I predict that Dave will give heartthrob, Patrick Dempsey, the new owner of Tully’s, a run for the title as the most gorgeous and charismatic Java hunk in the Northwest! ~ Chocolate molds (rigid molds are better than flexible), mini-muffin pans with fluted paper liners, or a sheet pan lined with parchment or foil. 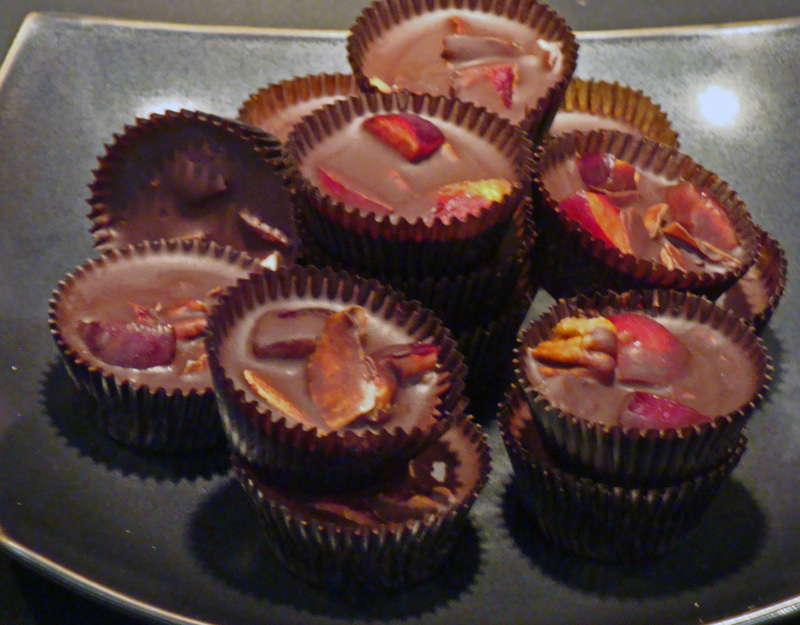 Do not grease the molds; the chocolate will shrink as it sets and release easily. ~ A fine micro-plane grater. ~ An accurate thermometer (a special chocolate thermometer, if possible). ~ A double boiler or a bowl that fits snugly over a saucepan OR a heat-safe container with a spout, like a Pyrex measuring pitcher, to make the recipe in a microwave oven. With a fine micro-plane grater, grate 5 grams (about 1 tbsp, grated) of the cocoa butter to use to “seed” the chocolate for proper crystallization. Reserve finely grated amount until ready to temper chocolate. Chop remaining cocoa butter into small chunks. Test your double boiler with cold water to see how much the bottom pan will hold without touching the top pan. Put that amount of water in the bottom pan and when ready to use, bring to a simmer. Reduce heat so water is hot but not bubbling; cycle heat on and off if necessary. Place the liquid sweetener(s) into the top pan of the double boiler. Sprinkle a few grains of salt directly onto the liquid sweetener so it will dissolve. Split the vanilla bean lengthwise and scrape the tiny seeds into the pan. Add the vanilla pod as well. Add lecithin and stir to blend. Add chopped cocoa butter, except reserved amount, and heat over hot water, stirring frequently, until melted. Leave over hot water with the burner off for 1 hour to infuse. After 1 hour, remove the vanilla pod and any large particles but leave in the seeds. Reheat the cocoa butter if necessary until it is warm and liquid. Stir cocoa powder into cocoa butter mixture until melted and smooth. (From now on, you must be very careful not to get any water or steam into the chocolate. 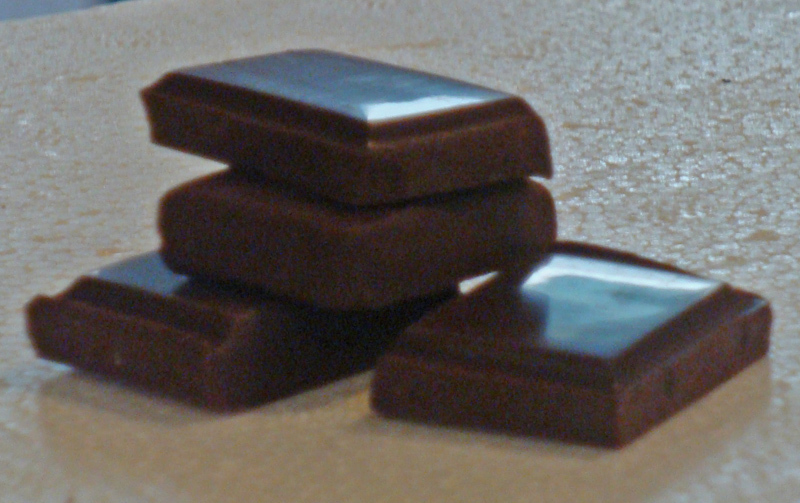 Remove chocolate from heat and let cool to 95°F (35°C), stirring and testing with the thermometer frequently. 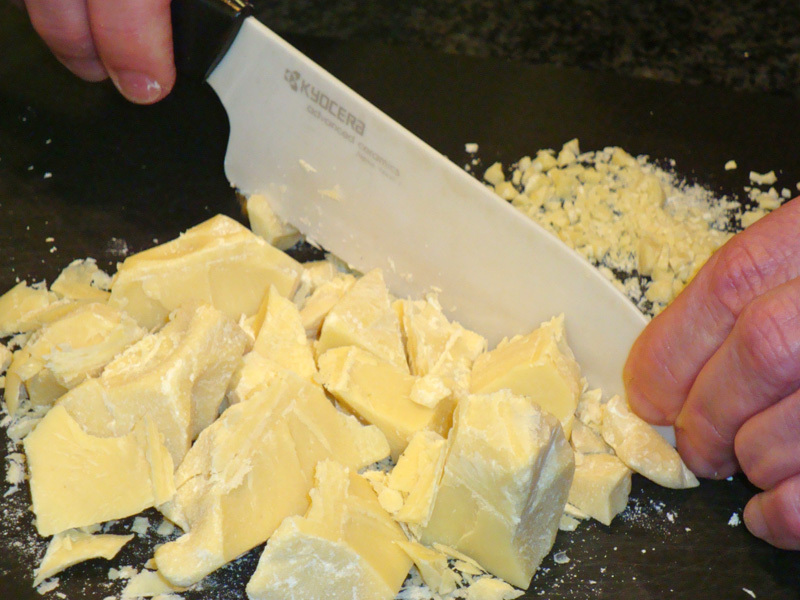 Immediately add the reserved micro-planed cocoa butter and stir until it is dissolved and the mass is smooth. Let the chocolate continue to cool, stirring and testing frequently, until it cools to 90°F (31.5°C). When it reaches the target, pour it into molds or onto a sheet pan in a 1/4-inch thick layer. Refrigerate, if desired for faster setting, but do not freeze. It will continue to cure for 12 to 18 hours. 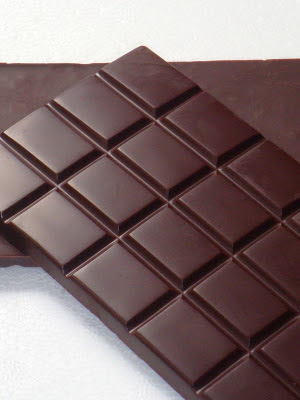 Remove chocolate from molds or peel off parchment or foil and break into pieces. Place liquid sweetener(s) in microwave safe container and sprinkle the salt directly on the sweetener so it will dissolve. Split the vanilla bean lengthwise and scrape the tiny seeds into the pan. Add the vanilla pod as well. Stir in lecithin and chopped cocoa butter as above. Heat on 50% power for 15 seconds, stir, and continue to microwave in 15 second bursts, stirring after each, until cocoa butter is melted. Leave in microwave with door closed for 1 hour to infuse. Remove chocolate from microwave and let cool to 95°F (35°C), stirring and testing the temperature frequently. Immediately add the reserved micro-planed cocoa butter. Stir until the cocoa butter is dissolved and the mass is smooth. Let the chocolate continue to cool to 90°F (31.5°C), stirring and testing the temperature frequently. When it reaches the target, pour into molds or onto sheet pan in a 1/4-inch thick layer. Refrigerate, if desired for faster setting, but do not freeze. It will continue to cure for 12 to 18 hours. Remove from molds or peel off parchment or foil and break into pieces. Makes 8 oz of candy. I had some lovely, fresh Bing cherries so I put them in my candy. I didn’t expect them to last very long, but I have a few left in the refrigerator after four days and they are still perfect. They may last longer than that, but I doubt that I will ever know! 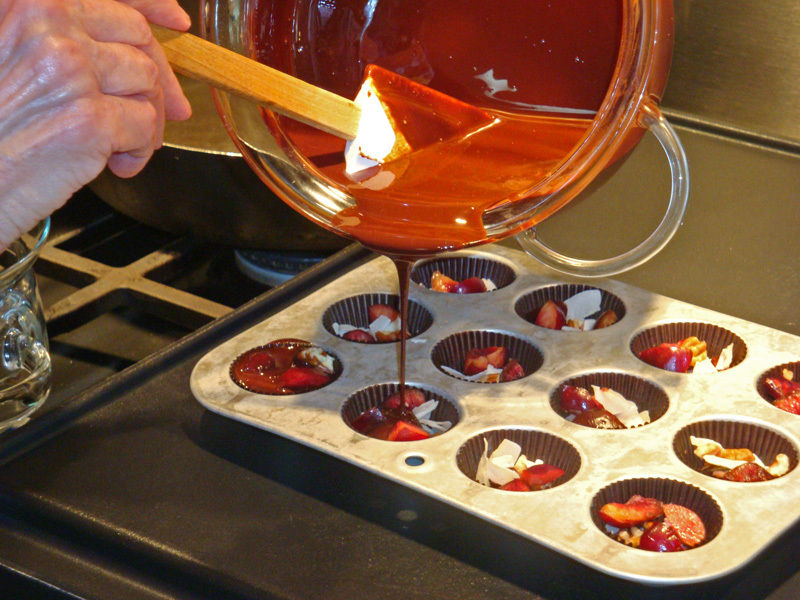 Place fluted paper liners in mini-muffin pans. Divide cherries, nuts, and coconut flakes evenly into cups. Pour melted chocolate over fruit and nut mixture. Let cool. Keep in refrigerator but let warm up a little before eating. Use dried fruit instead of fresh for longer storage or to keep at room temperature. Perfectly tempered chocolate is smooth and uniform and it breaks with a crisp snap. It will set up quickly, it can be stored at room temperature, and it will not develop a white bloom caused when the cocoa butter separates due to too much heat or humidity. It can be refrigerated as extra protection against bloom, but bring it to room temperature before serving. Lecithin contains phosphatidyl choline and the essential fatty acids, choline, and inositol. Lecithin aids in emulsifying fats. It is made from soy, sunflower seeds, or egg yolks. Dave has a link on his site to a brand he recommends. Lecithin is the secret to many of the techniques used in Molecular Gastronomy because it stabilizes foams and emulsions. A new way to make real chocolate, Chocolate, Chocolate Bars, Coffee, Fruit and Nut Candy. Bookmark. Thanks, Ren! I enjoyed your post as well. I didn't know there was anyone else nutty enough to make chocolate from scratch! Looking forward to meeting you in Seattle at IFBC in September. This blog really piqued my interest. To be honest, I've never really heard of either Dave Asprey or a "magic coffee" before so I was a bit skeptic but reading more and more about it made me want to try it for myself. Thanks Judy, this blog entry made me learn something very interesting today. I'm not sure Dave Asprey would approve of you misusing his Bulletproof trademark, especially using an ingredient like Sucralose to effectively turn it into a homemade frankenfood!! I sent the article to Dave before I published it and made some alterations based on his suggestions. Since I specified his cocoa powder, I thought I needed to use the trademark. Many people have strong opinions, bordering on religious fervor, about sweeteners. That’s why I try to accommodate everyone by giving the equivalent amount in sugar and letting them choose the one they want. We can argue endlessly about various sweeteners (I avoid some of them) but I feel secure in saying that almost anything is better than sugar. Sugar is sugar, whether it comes from a beet, a cane, a bee, a maple or coconut tree, or corn. In my opinion, we need to be open to whatever the science shows rather than, like Luddites, rejecting something simply because it is modern. Dave certainly embraces modern technology in his methods. He has promised a post about sweeteners soon, so I will be interested in what he has to say on the subject. You are welcome to share your opinions here, but I would appreciate it if you would sign your comments to help separate out the trolls. When do you add the vanilla bean in the microwave recipe? Thanks Georgia Peach. Good catch! I changed the directions in the recipe. The vanilla goes in the pan before the 1 hour standing time so it can infuse.